Count on us to help with your spa or hot tub. When you use SpaGuard® spa and hot tub chemicals, you are enlisting a group of individuals whose expertise is unsurpassed in the spa, hot tub and pool industry. There are five key reasons why we are your best choice for spa care. We are highly trained, well-equiped, experienced, friendly, focused and trustworthy. Our customized spa programs make spa care simple and give you soft, soothing water. What's more, you can rely on our expertise and knowledge to guide you along the way and answer your questions. Bacteria thrive in hot water. To keep spa water protected all of the time, a sanitizer is needed even if the spa is equipped with an ozone system. When people use spas, they leave undesirable compounds like body oil, perspiration and cosmetics that can irritate skin, burn eyes and create odors. Oxidizing, also known as shocking the water, removes these compounds and restores water clarity and comfort. An oxidizer should be used weekly in most residential spas and more frequently in heavily-used or commercial spas. Balanced water is essential to soaker comfort, water clarity, sanitizer efficiency, and the longevity of spa surfaces and equipment. The SpaGuard family includes products to manage that balance. 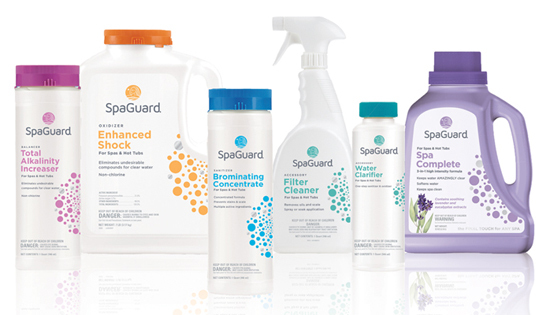 The SpaGuard line of cleaners and clarifiers improves the water's appearance, extends filter performance, and protects spa surfaces. Combines 6 benefits into 1 easy-to-use kit. Soft Soak® TRIO™ makes spa care simple. The pre-measured packets eliminate the guesswork and the easy step numbers let you know exactly when to add them.